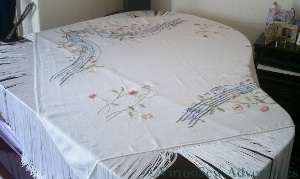 The Piano Shawl was only a metre and a half square (only! ), so there wasn’t really space for a stave in each corner, even if Elaine had wanted four melodies included! At the same time, there was enough space in the corners that without something there, the whole thing looked half-hearted and unbalanced. So I had to do something. I traced some of the stems and devised a very light floral motif, consisting of four stems and a few leaves. The main stems are worked in Broad Chain Stitch, using a plain stranded linen thread, which I used in the stems on the main design elements too, but the shorter, smaller stems are worked in Portuguese Knotted Stem Stitch, using a variegated silk thread. 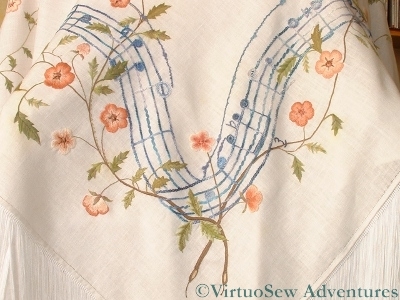 I used several different variegated silk threads for the leaves throughout the Piano Shawl. Again this is by no means a naturalistic treatment – the flowers are something like dog-roses, but the leaves (all worked in Fishbone Stitch) aren’t like any I’ve ever seen in a garden before! My final picture is a shot to show my initials in Morse Code in one corner, pretending to be a caterpillar! The picture also shows the centres of flowers, which were the same across the piece. The thread is a variegated, almost untwisted rayon thread, and it is used only in the centres of the flowers. It’s very like the thread I used for the headdress of the Prince’s Companion in the Persian Fantasy companion piece. Now that I have seen the Piano Shawl in its destined place, I am happy with it. The overall effect is light-hearted without being entirely frivolous, and the time spent in Elaine’s music room pulling threads, and draping them over the furniture to make sure that they would all match nicely, wasn’t wasted. However eccentric it might have seemed at the time! Since I had some requests for more details about the Piano Shawl, I rummaged around in my photographs to try to come up with pictures that might explain a little more of what I did and how I approached it. I knew that I would be using some variegated threads and some plain ones, so the first decision I made was that I would use each in particular places. In that way there would be a scheme of sorts that would guide me. First of all, the ribbon stave was definitely going to be variegated. It would help to create a ripple of life around the design, and incidentally, since it felt like miles of stitching, I would be able to feel the progress I had made in an afternoon in the colour changes. Then I felt that the colour alone did not provide sufficient structure, so I developed the scheme further – the chainette ribbon was couched down as the middle line on the stave, and also used for bar lines and clefs. The next two lines of the stave (one on each side of the central one) were worked using pearl cotton, in Portuguese Knotted Stem Stitch, which is a favourite of mine. I used it elsewhere for some of the stems, in a very fine silk thread which produced a very different effect. The two outer lines of the stave were stitched in ordinary chain stitch using a rayon bouclé which was serious trial to stitch with, but which looks really effective. The flowers themselves I worked in ordinary stranded cotton, using about six different shades of browny-pink, and creating an entirely un-naturalistic variety of light edges and dark edges, strong and weak colour variations. There was the risk of producing something too stately if I tried too hard, and since the Shawl was destined for a grand piano, the surroundings were going to be pretty stately already. A grand piano is a pretty dignified and imposing piece of furniture! 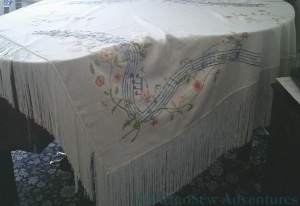 Although putting the fringing on brought the whole thing to life – which goes to show how important the finishing details are for big projects – I was very relieved when I delivered the Piano Shawl, and it settled into its destined home as though I’d sat there to stitch it. As I don’t have any rooms decorated in similar colours, I wasn’t confident when I finished the piece, until I saw it in place. Phew! I created a booklet to go with the Piano Shawl, which included a short description from Elaine, describing why she wanted it, and the following, describing how I tackled the commission. This was an intriguing project, growing out of several conversations, visits to the Client’s house, and an assortment of research in libraries and online for suitable images and inspirations. The ultimate inspiration was a scene in a painting in which the black polished surface of a grand piano was broken by a patterned shawl. In adapting the inspiration to circumstances and ideas, we decided, rather than using a scattered all-over pattern, to develop an undulating stave design, entwined with flowering stems. 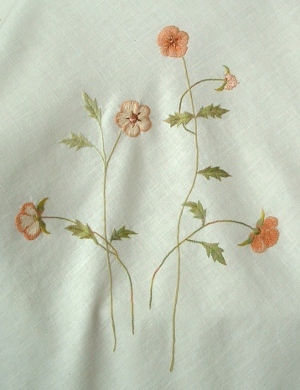 The flower patterns were developed from the shapes used by my grandmother in one of her embroidered tablecloths. 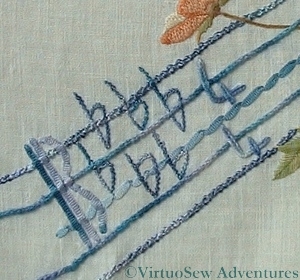 As she set me off on my embroidering way, I always try to include some idea or reference in big projects! We chose to pick up the floral pattern of the carpet, dusty pinks and apricots for the flowering stems, and take the blue background as the basis of colours for the stave. Then I asked Elaine to write out for me the musical elements that she wanted to have put on the staves. In the event, this piece involved far less variety of stitch technique than the other design ideas I had thought of, but at the same time it gave scope for a much wider range of variegated threads. The blues used in the stave are brighter than those in the carpet, because darker colours would have dragged the design down, making it seem less light hearted. 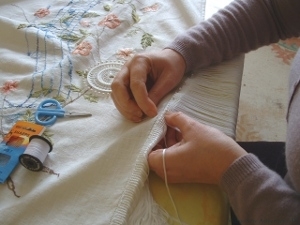 There is always a balance to be struck in embroidery between the naturalism that is available through needlepainting techniques and producing something that is clearly an embroidery. I almost always choose to do the latter, because the textures of fabric and thread as they are used in embroidery are what interest and inspire me. My initials and the date are included in Morse code, on diagonally opposing corners. Now Elaine not only has her Piano Shawl, but something for the archives as well. I’m in the very last stages of a very long running commission here. It’s one of the reasons my reading of blogs has been sporadic of late – I’ve been working very hard on this! Anyway, the last stage is to add fringing all around the edge – some six metres of fringing, which is why it isn’t happening all in one go – although we will need the dining room table again soon (I don’t have a studio – I only wish I did!). And I am using the pins I won in a giveaway on Karen’s blog recently – thank you, Karen, they are working very well for this! I’ve learnt a lot from this project about managing, planning and specifying a commission. In particular, unless you can be guaranteed no disturbances, life has a tendancy to throw in the odd curve ball and suddenly progress slows to a crawl. It took over a year to find a suitable fabric that my client and I both liked, and over six months to find the fringing. Fortunately I haven’t had a hard deadline – my client wants it finished suitably and not rushed. That makes life much easier! I also discovered that I have a tendancy not to work on what I want to work on, unless I can put forward an over-riding reason why I should. “I’m being paid” works, but so does “I want to write it up for my blog” (now I have a blog, that is!) or “I’m learning something here”. What hasn’t worked – until recently – is “I’m enjoying it”. Still, it’s within eyeshot of being finished, now. Another day on the fringing, and then I shall take some photos from the right side before presenting it to my client. I’ll post those after she has seen it!